What is a Company’s purpose? To be profitable, and self sustaining, while providing a product or service. But can it make a difference, not just make money? The answer is yes, and this has been the key question in my mind for the past few years. Both personally and professionally, I’ve gone through a process where I’ve evaluated how I work and what I work on, and how I might be able to make a difference within my sphere of influence. This isn’t a navel-gazing or self promotion post, so I’m not listing the things I’ve done or am doing, but rather posting this in case you are thinking the same thing. Maybe my process can help with your thinking. Or maybe you’re way ahead of me on this, and you write back with some tips for me. Both would be super. See, I was deeply unhappy with work. I have one of the best jobs on the planet – I get to meet, and sometimes work with, amazing visionaries almost every day of my life. Directly and indirectly I’ve been involved with some of the best tech companies of our time. So why would I be unhappy? Well, I realized it was all really just about returns. Making money. Was it a mid-life crisis? Probably. I didn’t always think like this. Once I did, it took me a solid 3 years to figure out how to achieve my personal objectives within the confines of my corporate life. I defined the problem very quickly – but working out the way to *solve* it was really the tricky part. But it’s all obvious now in retrospect. Personal Health and the Environment. Pretty important areas in general, and two things that I’m really passionate and nerdy about. How do I take those areas, a desire to make a difference and marry that with my responsibility to my corporate world? Answer: focus on technologies that achieve both objectives. Many of you will know, I spend 80%+ of my time looking at autonomous car technologies. This is very central to my corporate world. Does a new sensor or an innovative Lidar component or maybe some smart path planning software change the world? Nope. Absolutely not. But it DOES enable autonomous vehicles to become a commercially viable reality. And this is where I get very excited. Car related deaths are a top 10 killer in every country on the planet. In some cases it’s a top 5 killer. Any part – big or small – I can play in reducing that number is a huge win. Millions of lives. Every year. Lost. Self driving cars means that number will change radically. And THAT is something I can get really excited about. I’m also a cyclist, and have had many near misses on the roads. Many friends haven’t been so lucky. This is another great by-product of self driving cars. No (or limited) car / bicycle related accidents or deaths. I hear what you’re thinking – “But Jason, you’re a VC and of course you can do things like that! I can’t”. Let’s assume for a second you’re a waiter at a restaurant. You dislike plastic as much as I do. It’s poison for our planet. So you say to the manager “Hey, I found these cool straws that aren’t actually plastic – they look like plastic and act like plastic, but they decompose. Could we start using these instead?” Small win, but it’s a big win. That’ a LOT less plastic in the world. But maybe the manager says “No.” Ok, what are the recycling policies of the restaurant? Can you make an impact there? When you stop and look at where you can make a difference in your daily activities, you’ll find all kinds of things you can do. Things that are meaningful to you. And then you’re not just making money (for you or for someone else) but you’re also making a difference. If you’re doing some cool things, please shout – tweet, DM, comment, etc. I’d love to hear how anyone reading this is changing the world one straw at a time. 1) Tenacity. Starting a company is hard. If anyone could do it successfully, everyone would be a successful multi millionaire/billionaire entrepreneur. As we all know, that’s not the case. What separates the wheat from the chaff? The ability to fight long after others have gone home. And wake up again, take on Goliath, and fight until you bleed. And then do it again the next day. And the next. 2) Self-sacrifice. Being successful doesn’t happen overnight and it doesn’t come for free. Many founder/CEOs I’ve worked with have been the first to cut their paycheck to zero, to invest their last dollar and even end up in divorce. I’m not suggesting that level of sacrifice is what it always takes, but if you’re going to get in the water with sharks, you’d better be willing to lose a leg. Or more. If you can’t deal with that level of risk (commitment), you’d probably better stay on the beach. Something will definitely be lost along the way (and other things gained). Women and Tech. It’s an area that’s been getting a lot of attention lately- especially the conversation around Twitter’s board. I realized a few months ago that Qualcomm Ventures has a significant percent of female co-founders, CEOs and Chairwomen in our portfolio. For Europe, it’s 50%+. That’s right – over HALF of our companies… are founded, co-founded or chaired by women [blippar, CTC, ip.access, Rockpack , Grand Cru, Everplaces and Arieso (now exited)]. There wasn’t a decision to actively target female led companies, it’s simply a pattern that emerged. And it’s an impressive one. A recent study carried out by Carnegie Mellon and MIT professors showed that teams that contain at least one female outperform male only teams in collective intelligence tests. Women in tech have historically been too few an far between. However, this is changing and there are clearly some shining stars right now – Sheryl Sandberg and Marissa Myer are probably the most visible. In London, there’s a host of local female heros as well – Jessica Butcher from Blippar, Divinia Knowles of Mind Candy (Moshi Monsters), Joanna Shields of Facebook, TechCity and Future Fifty fame, Sitar Teli, Partner at Connect Ventures, Reshma Sohoni, Partner at Seedcamp… and the list goes on, and on… and on. Women are starting, funding and floating companies. This is an awesome change. One that’s been a long time in the making… and a change whose time has come. (P.S. Tip of the hat to all the Techbikers crew, guys and girls. 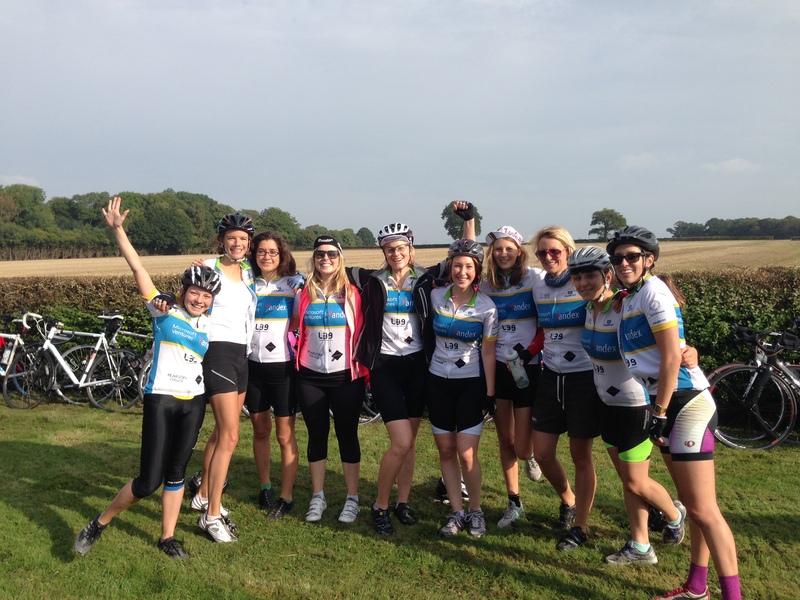 A group of 70 of us raised $75,000 for charity cycling 200 miles from Paris to London in September. More in the Techcrunch article here). I posted my Three P’s of Venture Capital a few weeks back – Product, People and Potential. E.g. you need to be going fast enough to overcome the Earth’s gravitational pull. Or, for startups, you’ve got to have enough momentum and acceleration to break away… There are several components to this, and they don’t all have to be there, but one of them gives you the fuel you need…. 1) Lots of funding. This is pretty straight forward – you have cash to do everything fast – and if you really raise a lot of money, implement the King Maker Strategy, e.g. raise so much funding you can guarantee your own success. 2) Office in the US (or plans to have one quickly) – either NYC or SF. Depending on where customers and partners are. This also gets you closer to your most likely acquirers. Keep R&D wherever you have it, and head West. 3) Connections. You need intros and doors to be opened. What’s that you say? “But that’s your job Mr VC to make intros” True, it is, and it’s something that all VCs do to varying extents. But you need your own networks – maybe you’re an ex-Googler or you went to Stanford, Oxford, Cambridge, Harvard or your co-founder did, etc. The old adage “it’s not what you know, it’s who you know” still matters. More than you possibly realize. You can borrow this from your investors, but you need to bring some of your own connections to the party. If you don’t have them, start making them. You will need them. 4) Chutzpah. Use this if you’re short on any of the above. With enough will, charisma, sheer determination and a bit of luck, you can break away. But this one is more of an art, but I have seen it in action – and it’s impressive. I’m sure there are a few more I could add (great design comes to mind) – and feel free to add any in the comments below. Hopefully this gives more color on what’s going on inside my head when I’m thinking about an investment…and what you need to make it as an entrepreneur. First a preface: I’m not a crazy tree-hugger, but I’m fortunate enough to live in a place where being green is relatively straight forward- central London. I don’t own a car (it’s impractical), I ride a bicycle and take public transportation, there are recycling containers in my apartment building, most of the lights in the house are eco lights, I shop locally and try to buy local, in season foods, when possible, etc. Most of this is a by-product of where I live vs some deep belief that cycling in the cold rain is better for mother earth than driving in a warm, dry car (traffic in London is a nightmare). Back to the story – a few months ago I stumbled across a company called Splosh.com. They have introduced an environmentally friendly detergent brand. The concept is simple: you buy a few empty bottles, they sell you a few refills, you add water and presto magico: you have your cleaning product. The logic of recycling is not consistent across different material types. For example, it makes a good sense to recycle aluminium cans, but the logic for recycling plastic homecare bottles is less clear. Let’s see what happens to that plastic washing up liquid bottle you put out for recycling. And finally these pellets are re-manufactured into another washing up liquid bottle? No. Owing to ‘taint’ (the residue left from home and personal care products) only bottles containing drinks can be recycled into other bottles. So your washing up liquid bottle gets turned into something like a fleece or a road traffic cone. In other words it’s not recycled, it’s ‘down-cycled’. And when this new product comes to the end of its life? It can be down-cycled no further and ends up in landfill. The sad fact is: every plastic home cleaning and laundry bottle ultimately goes to landfill – and that’s not something you would imagine happens from looking at that neat little recycling logo. So when a bottle is made from recycled material, the material used is usually either ‘pre- consumer’ waste (in other words un-used bottles) or former drinks bottles. Milk bottles are often used as they provide a consistent source of material with little contamination. This means that a recycling logo on a home cleaning product bottle does not stop the manufacture of another home cleaning bottle the next time you buy the product. It’s an illogical system and we can do so much better. After reading that, you’re kind of hooked. But then enter splosh’s killer reflill approach: they sell small refill sachets that can easily be shipped via regular mail. They cost <$5 per order. That’s less than you’d pay for the competing product on grocery store shelves, and you don’t have to lug it home (remember, I ride a bike). Plus, they’ve done this enough that you get a refill reminder email a few weeks before you run out….which is just plain smart. Re-ordering is a simple process that results in 2-3 clicks max. I’ve used up my intro pack and have placed a few refill orders already. I will be a long-time customer because the products deliver, I save money and it’s environmentally sound. Talk about win-win-win. 5) Offer an introductory special – anything to get the ball rolling. If you can charge for this, even better. 7) Go for green bonus points! So, if you live in the UK, go grab some splosh. Or buy it for a friend as a bizarre birthday present. Mother Earth will smile on you (even if your friend thinks you’re odd).